Dave Karp opened the first Cole Hardware store in San Francisco in 1959. He wanted to create a service for the people in his community. "COLE HARDWARE'S PRINCIPLE AS A COMPANY IS TO PROVIDE SERVICE AND KNOWLEDGE." Over time, they realized that people prefer to shop on the internet and they are losing revenue to online competitors such as amazon. But Cole Hardware is a proud community service provider and prefer to remain to help the needs of people in the community. I did user interviews, research and the visual designs such as paper prototyping and wireframes. I partnered with two UX designers with strong research and interview backgrounds to collect and synthesize data to address user needs. I targeted current users and asked questions based on their current pain points that led to ideation and our design decision. I created paper prototypes and tested them early on. With Sketch and Invision, I was able to share design ideas and iterate between user testing. Users find the Cole Hardware site to be very confusing to navigate, items are impossible to find, and certain links lead to error messages. When I talked to an employee, they said their site is mainly to serve as informative source for their community and not exactly for people to shop. But because they realize that they are losing to online competitors, they want to improve their site but not lose the 1-1 interaction they've been having with their customers for decades. I reached out to Cole Hardware to get a better understanding of their mission and how I can help them grow their business without changing their business model. Cole Hardware's principle as a company is to provide service and knowledge. They value in person relationships and are loyal to their customers. They realize that they are losing revenue to online stores. They do not have the money or man power to hand pick items in store and ship them out to customers. "SOMEONE TRIED TO BUY A POOL FROM US IN FLORIDA AND WE CANCELLED THEIR ORDER BECAUSE WE WOULD NEVER GET TO MEET THEM IN PERSON." Life long customers didn't even know Cole Hardware had a website. All customers know the owner Dave Karp personally, and remembers his famous card tricks. They prefer to go to into the store to ask questions and interact with workers and get the best advice they need. "THE STAFF HERE IS WONDERFUL. THEY ARE ALWAYS HELPFUL AND REALLY GO OUT OF THEIR WAY TO FIND EXACTLY WHAT YOU'RE LOOKING FOR." Thomas is the type of person that would rarely shop at Cole Hardware. Meanwhile Andy could be considered a frequent loyal customer. Cole Hardware should have an online store that can cater to both personas. I did a competitive analysis in order to get a sense of what competitors are doing. Cole hardware's biggest competitor is Amazon. But they are also losing revenue to Home Depot due to their strong search options, reviews and details. With that information, my assumptions are that Cole Hardware can improve on their search options, adding product reviews, and having a secure checkout process to improve the experience for people such as Thomas and Andy. First I wanted to create a user flow in order to get a better understanding of how Thomas might navigate through the page. Thomas can browse through the most popular items giving Thomas reassurance that he's in the right area. He can narrow down his search with reading reviews from previous buyers and add the item to cart. Unfortunately there are too many steps from start to finish, leaving Thomas flustered. I thought it was very important to make sure Thomas and Andy can quickly find what they were looking for with the helpful suggestions from the site. I then created different paper prototypes to test. I quickly learned that there were too many options for users to choose from. They weren't sure where to look for the perfect chainsaw for Charles's birthday gift. I thought the ideas button would give inspiration to users, but it confused them instead. Users also preferred not to click on it. People mainly clicked on the project pictures because it's the biggest call-to-action button. The next step was to figure out the most legible way for Thomas and Andy to read reviews, ratings and also see details. Adding the modal when an item has been added to cart can reassure Thomas that the item was added so he doesn't accidentally add two. Next, the checkout process needs to be reassuring and secure in order for Thomas and Andy to know exactly what they're purchasing with their preference of purchasing option. I added a modal to allow users to choose their payment method and users liked it! Interestingly enough, when I created the modal in my wireframes, users felt like it was abrupt, unexpected and they didn't find it secure. The address & payments page allows Thomas and Andy to enter all their information carefully while the summary of the item and costs remain on the right hand side for them to review. The review page allows Thomas to review his order, be reassured of the item he is purchasing, where it will be shipped, and ensure his customized gift option is in place. The solution consists of a search bar that would guide Thomas and Andy straight to the item. Many items would appear but there is an option to select multiple items and compare them in order for Thomas or Andy to see the minor details and reviews in both items. They then get to add the item to cart and finish with including a gift option and reviewing their order before finalizing their purchase. I learned that not all test results from paper prototypes will translate well when built as an app or web design. I also learned that it is very important to test prototypes constantly and with different people. I would like to incorporate more of an interactive sales approach where a Cole Hardware employee can answer questions, give advice, and choose the best items for their customers, just like how they do in person. Literator was created by a teacher named Michelle who was heartbroken when she realized that her students test scores were not on the rise. Michelle's district incorporates the F&P system - a strict curriculum with at least 30+ questions that places students on a scale from A-Z depending on their reading levels. This makes the questions difficult for teachers to memorize and utilize on the spot. SO I CAN TEACH IT." After being constantly tested by her administrators, Michelle finally put her foot down and created Literator - an app that incorporates F&P questions, levels, and tracks students progress. I reached out to over 50+ teachers for interviews and the visual designs such as paper prototyping and wireframes. Teachers prefer to use the simple method of pen and paper. "SOME TEACHERS DON'T EVEN OPEN THEIR EMAILS; THEY THINK IT'S TOO MUCH TROUBLE." Many teachers have been encouraged by their administrators to download the Literator app but they choose not to use it. We need to prove to teachers that Literator can improve their work flow that pen and paper can not do for them. My team and I met with Jing, the co-founder & CPO of Literator. During our meeting, she shared their research that teachers barely have 1:1 meetings with their students. The ideal amount of time to meet with a student is for 2 minutes at least once a week. TEACHERS WILL MISS THINGS AND MIGHT NOT MEET WITH STUDENTS AS MUCH AS THEY SHOULD - HOW DO YOU DESIGN SOMETHING YOU CAN'T PREDICT?" Literator’s hypothesis is that teachers need a scheduling feature in order to schedule 1:1 conferring with students. Before tackling the challenges and jumping into design sprints, we had to understand education lingo that the app uses. The literacy system that is becoming common core for districts to implement in their school system. The F&P system consists of questions and rating levels that establishes a students reading level. Every year, the district requires each class to finish at a certain reading level by the end of the school year. F&P stands for Fountas & Pinnell, last names of two women that examined the literacy learning of thousands of students. Their studies proved that the most affective way to improve student reading scores is through small group and 1:1 meetings. BE HONEST, AND SHOW THEM THAT YOU CARE." We created a survey that target teachers that teach grades K-6, literacy and also use the F&P system. We can then synthesize and understand the pain points that teachers have in their classroom. "ONCE WE START CONFERRING, THE STUDENT WOULD SAY 'IT IS A BAD DAY' AND WE WOULD TAKE A BREAK. I WONDER IF THE TEST HAD ACCURATE RESULTS." We did a competitive analysis to compare features that other apps have and how we can incorporate it into Literator. Litarator doesn't have direct competitors but there are many apps that teachers and school districts prefer to use. Teachers use apps that can communicate and share data with parents and administrators. But the true winner will always be pen & paper with Google Docs coming in close second. We drew a storyboard to get a better understanding of what a day in a life of a teacher is like. Ms. Merritt's day to day consists of being up at 5:30am, getting her first cup of coffee at 6:30am and starting class by 8:30am. She starts the first hour of her day teaching English where she can start 1:1 sessions with her students. While she reads the F&P prompts to her student, she listens to her student read, take notes and also makes sure that the class is in order. When school ends, she begins to input all the notes manually if she hadn't lost them already. After 10 qualitative interviews with teachers, the results came out to be a lot different than what the initial hypothesis was. "CLASSES WERE ONLY 60 MINUTES LONG AND I WOULD HAVE ABOUT 15 MINUTES TO HAVE 1:1 TIME WITH STUDENTS. SO I WOULD GROUP 5-7 STUDENTS TOGETHER BY SKILL AND TALK TO THEM ALL AT ONCE." Literator is having difficulty retaining and growing their user base, even though they provide an essential service. Since teachers have been having trouble with keeping notes together and getting through to every student, we added a note feature, a timer and also sorting options. We added a personalized homepage because teachers teach multiple subjects/classes and may have different rosters. This will allow teachers to switch between classes and be sure of which class they are preparing to confer with. Also, the motivation sun was a good way to remind teachers of their weekly goals and entice them to return to the app and complete their goals. Adding the sort by feature allows teachers the flexibility to group their students based on their needs. This will help teachers to determine which students to meet with and in which particular order to lessen the time during the planning process. Follow the steps and confer with the next student near you! 3. Looks like Aden needs her help! I learned that communicating with the client is very important. There were features that were going to be implemented on the next sprint that we could have known about early on if we had communicated. I also learned that teachers are very very busy people and that we should never underestimate them. Most importantly, I learned that every sprint does not require a drastic redesign. I felt like we were on top of the world when we got the project. I wanted to change the flow, colors and outlook but stopped when I asked myself "what do teachers need?" I would like to bring in the concept of tracking, motivation and encouragement. (Like a workout app!) Although we may have added a grouping feature, we can also include a way to motivate current and new users to share data with teachers, parents and students. This can motivate teachers to continue using the app and maintain their goals of improving students literacy levels. I will also be communicating with the client constantly to inform her of the direction and findings that we have. This is very important because I do not want to miss any business goals or ideas that the client may have that I should be aware of. Four Seasons noticed 3rd-party services are capitalizing on discounted rates for rooms and would like to compete with them. 3rd-party services will charge a commission fee of roughly 15% -30%. (If a room is $450, the hotel will earn roughly $380) Because of that, hotels will match prices that people find online or they are more inclined to offer people upgrades, better perks or complimentary add-ons. "IF YOU FIND LOWER PRICES ELSEWHERE, GENERALLY YOU CAN SUBMIT A CLAIM SO THAT THE HOTEL WILL MATCH THE PRICE." Four Seasons wants to find a solution to averting third-party users to their site. I put together the paper prototypes for testing, built the wireframes also to test and carefully planned out the interaction design. I created paper prototypes and tested them through Sketch and Invision. I was able to share design ideas and iterate between user testing. Most people do not know that they can receive an upgrade or discount if they book directly on a hotel site. But what we are having trouble with is establishing the difference between third party sites and official sites and why people choose one or the other. "SOME HOTEL CHAINS HAVE GONE AS FAR AS TO AUTOMATE THIS [COMPARING PRICE] PROCESS ON THEIR BOOKING ENGINES, SO THAT WHEN TRAVELERS SEARCH FOR DATES, THE SITE WILL AUTOMATICALLY MATCH THE LOWEST PRICE AVAILABLE." With this information free for anyone to find on the internet, why is it still uncommon for a person to instinctually book directly with a hotel instead of using third-party sites? In order to answer that question, we needed to learn about our competitors and what they are doing in order to attract people to book with them. I immediately started a competitive analysis. Not only does Four Seasons compete with third-party sites, they are also competing with five star hotels just like them. Lacking benefits that are immediate to the users. After the competitive analysis, we wanted to talk to loyal guests at the Four Seasons to learn what they love about the hotel and why they remain loyal no matter where they are in the world. "YOU KNOW YOU'RE GOING TO HAVE A GOOD EXPERIENCE... IT'S THE FOUR SEASONS." We released a survey and interviewed users to verify our assumptions (price and reviews) and to target users pain points of booking with third-parties. "I USE THIRD-PARTY SITES TO COMPARE PRICES AND REVIEWS. BUT I WOULD ALSO CHECK THE HOTEL SITE FOR PERKS." With all of the research that we have collected, we synthesized the information and created a persona that will guide us to designing for a large majority of users. Sam wants to book a hotel for his wedding anniversary for their service, amenities and opportunity to customize their stay. We gave ourselves the chance to come up with the craziest idea possible. This gave me the idea of wristbands or a "magic card" that can allow the freedom for Sam and his wife to access hotel amenities without needing to planning ahead. This will allow the convenience and customization of the services that Sam and his wife can pick and choose from after checking in. But we tested and learned that some people want to plan and pay for her trip beforehand. Here, the idea of the Gold, Diamond and Platinum tiers were born. These are essentially "packages" that Sam can choose during the booking process depending on how extravagant he wants to be. Sam can easily scan and select the amenities he predicts him and his wife would enjoy together. Our hypothesis is that people are not aware of what hotels have to offer. So in order to keep the integrity and class of hotel standards, we created three tiers [Gold, Silver and Platinum] packages in order to attract guests and inform them of what hotels can offer that one can't find when booking on third-party sites. We redesigned the Four Seasons e-commerce site by packaging amenities that the Four Seasons offer to guests into the "Gold Standard". This will allow guests to see what amenities they will receive if they book directly. Stay as low fidelity as possible. We spent a lot of time creating a wireframe when we should have focused on interviewing and ideating more solutions to our problem. I have learned that there is no "shortcut" when it comes to creating the best solution for the user. The most important thing was that we got back on track, ideated and created a solution that benefited the user for the first sprint. I would also like to explore the road of creating travel packages for the Four Seasons, where people will be able to plan their experience during their booking process. San Francisco, 450 sq. ft. I first had to understand what does "luxury" mean in the ice cream industry? I studied the Honey Creme brand and learned that their values are to provide guests with the best quality ice cream made with the highest quality ingredients. 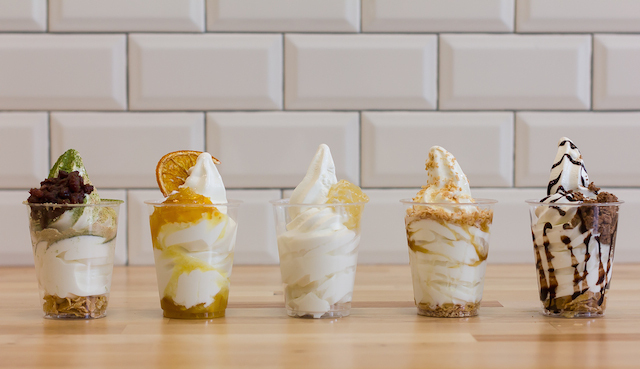 That being said, the first Honey Creme store in America needs to appeal to customers as a high quality ice cream store. Honey Creme needed the perfect location to catch the right audience. They settled with a location in the Sunset District of San Francisco for the robust community and families that constantly dine and thrive in the area. The problem is that the location was previously a retail space and there are city building codes that must be followed in order to convert to a commercial space. Did I mention that the space was about 450 sq.ft.? It's about half the size of Jay Z and Beyonce's bathroom. Our challenge was to fit a 45 sq. ft. toilet room, utilities, plumbing fixtures, prep counter and a check-out counter. We were also limited on time due to the high renting prices in San Francisco. The store was previously a jewelry store. So we had to update the store with ADA (Americans with Disabilities Act) requirements. This means that the bathroom, entryway, hallway, and interior space must be accessible to people in wheelchairs and disabilities. Originally, we thought the bathroom being in the front of the shop would be the most accessible. But it became a concern that people would be eating in front of the store and watch as people enter and exit the restroom. We decided to move the restroom to the back of the store. We finalized with opening up the space by lowering the walls to 4 feet instead of 8 feet. This allows customers to peer from front of the room to the back. Most importantly, the low walls allow employees to easily see customers walking in and out of the store. The controversial toilet room is built in the back to be hidden from customers but still open to the public.